Amazing Home on Mt. Crested Butte- Views from Every Direction! This home really feels like you're on top of the world! 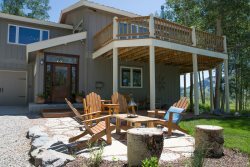 A truly unique mountain property, Daisy Circle offers an amazing place to call home where you can literally take in 360 degrees of pure high country bliss (INCLUDING PRIVATE OUTDOOR HOT TUB). Tucked away in a cul-de-sac, you’ll have the best of both worlds with privacy and seclusion, yet in close proximity to the base area and town. For the ultimate après ski, a large private outdoor hot tub lies perched on the back deck with views you'll be talking about long after your holiday stay.